High-ranking al-Qaeda leader Abd al-Rahim al-Nashiri is captured in the United Arab Emirates (UAE). Al-Nashiri is believed to have played a role in the 1998 African embassy bombings (see 10:35-10:39 a.m., August 7, 1998), attended a 9/11 planning summit in Malaysia in 2000 (see January 5-8, 2000), was one of the masterminds of the 2000 USS Cole bombing (see October 12, 2000), and planned the 2002 bombing of the French oil tanker Limburg (see October 6, 2002). Said to be chief of al-Qaeda’s operations in the Persian Gulf region, he is taking flight lessons in the remote UAE region of Umm Al-Qaiwain when he is arrested by local authorities and then turned over to the CIA. An unknown number of other al-Qaeda suspects are arrested with him, but apparently they are considered less important and are not handed to the CIA as well. Most reports indicate he is arrested on November 8, 2002, about two weeks before the first media leaks about his arrest. [New York Times, 12/23/2002] However, US News and World Report will later claim that he was arrested even earlier, early in October 2002. 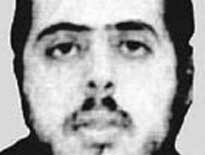 “Al-Nashiri soon broke; he even let officials listen in as he called his associates.” This leads to intelligence on Qaed Salim Sinan al-Harethi, a top al-Qaeda operative, and the US assassinates him with a missile strike on November 3, 2002, after trailing him for about two weeks (see November 3, 2002). [US News and World Report, 6/2/2003] Al-Nashiri will remain in secret CIA prisons until 2006 and then will be transfered to the Guantanamo Bay prison (see September 2-3, 2006). Qaed Senyan al-Harethi. [Source: Yemen Observer]A CIA-operated Predator drone fires a missile that destroys a truck of suspected al-Qaeda operatives in Yemen. The target of the attack is Qaed Salim Sinan al-Harethi, a top al-Qaeda operative, but five others are also killed, including American citizen Kamal Derwish. [Washington Post, 11/4/2002; Associated Press, 12/3/2002] Al-Harethi is said to have been involved in the 2000 bombing of the USS Cole. Bush administration officials say Derwish was the ringleader of a sleeper cell in Lackawanna, New York (see September 13, 2002). [Washington Post, 11/9/2002; Newsweek, 11/11/2002] A former high-level intelligence officer complains that Defense Secretary Donald Rumsfeld wants “to take guys out for political effect.” Al-Harethi was being tracked for weeks through his cell phone. [New Yorker, 12/16/2002] The attack happens one day before mid-term elections in the US. Newsweek will note that timing of the strike “was, at the very least, fortuitous” for the Bush administration. [Newsweek, 11/11/2002] New Yorker magazine will later report, “The Yemeni government had planned to delay an announcement of the attack until it could issue a joint statement with Washington. When American officials released the story unilaterally, in time for Election Day, the Yemenis were angry and dismayed.” [New Yorker, 12/16/2002] Initial reports suggest the truck was destroyed by a car bomb. But on November 5, Deputy Defense Secretary Paul Wolfowitz will brag about the strike on CNN, thus ruining the cover story and revealing that the truck was destroyed by a US missile (see November 5, 2002). [Newsweek, 11/11/2002] US intelligence appears to have learned of al-Harethi’s whereabouts after interrogating Abd al-Rahim al-Nashiri, captured the month before (see Early October 2002). 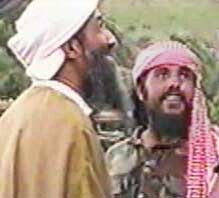 Qaed Salim Sinan Al-Harethi (right) with Osama bin Laden on May 26, 1998, in Khost, Afghanistan. [Source: CNN via Getty Images]Deputy Defense Secretary Paul Wolfowitz confirms that the assassination of Qaed Senyan al-Harethi in Yemen two days earlier (see November 3, 2002) was done with a US Predator drone that struck the truck carrying al-Harethi and five others. Initial reported suggested that the truck was destroyed by a car bomb, but this cover story is blown when Wolfowitz brags about the success of the operation on CNN, revealing US involvement. Newsweek reports that “The CIA, which ran the operation, was furious with the Defense Department for blowing its cover story.” US procedures required that the Yemeni government had to give approval of the strike in advance, and the revelation of such approval is highly embarrassing to the Yemeni government. [Washington Post, 11/6/2002; Newsweek, 11/11/2002] There are widespread protests in Yemen and the US Embassy has to be closed for a period of time following Wolfowitz’s revelation. [Salon, 8/13/2004] A knowledgeable source tells Newsweek that Yemen’s President Ali Abdallah Saleh is “highly pissed” about the leak. CIA officials worry the leak will discourage other countries from allowing Predator strikes within their borders. A former senior CIA official says, “The Pentagon view seems to be, this is good, it shows we can reach out and touch ‘em. The CIA view is, you dumb bastards, this means no other country will cooperate with us!” [Newsweek, 11/11/2002] Yayha Almutawakel, deputy secretary general of the ruling party in Yemen, says, “This is why it is so difficult to make deals with the United States. This is why we are reluctant to work closely with them. They don’t consider the internal consequences in Yemen. In security matters you don’t want to alert the enemy.” [Salon, 8/13/2004] Wolfowitz’s leak also starts a debate about the morality and legality of the strike, especially since a US citizen was killed (see November 5- December, 2002).